Rain pitter-pattered outside her window on October 28, 2012, but Maria Quiñones wasn’t fazed. She was busy cooking for her mother’s 75th birthday. Typical Puerto Rican dishes were on the menu: jamon, arroz con garbanzos, potato salad, and ribs. Quiñones and her family will never forget that day. Just 24 hours later, Hurricane Sandy swept into their homes, washing away whatever security they had felt in the seemingly invincible city. In the aftermath of Hurricane Maria, though, the reminders have been especially poignant. 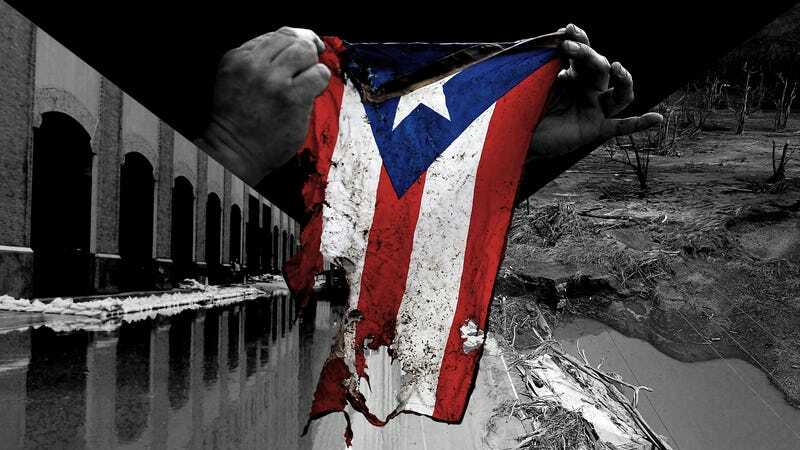 For Puerto Ricans who endured Hurricane Sandy, whose five-year anniversary fell over the weekend, the last six weeks have offered the worst kind of deja-vu. The trauma from powerful storms lives on; it’s a feeling families get when the rains fall too hard or when the lights flicker. That a person can lose it all and be powerless to stop it. Quiñones realizes her island will never be the same again, but neither will she. Not after Sandy, and not after Maria. In 2012, Quiñones knew the storm was coming. She and her family were ready for it—flashlights, water, and all. They wouldn’t let it rain on their mother’s birthday celebration. That is, until she got a call. Local leaders from tenant associations and the New York Housing Authority were calling an emergency meeting. Quiñones, a volunteer community activist who’s involved with her community’s resident association, had to be there. At the meeting, reality hit her: This storm was going to be bad. Hurricane Sandy killed at least 48 people in New York and 147 total. About 8.5 million energy customers in the U.S. lost power—some for weeks, others for months. No one was safe, but some definitely had it worse than others. Among those who were hit the hardest were residents on the Lower East Side, where Quiñones and many other Puerto Ricans live. With the Puerto Rican community’s impact in mind, the Sandy 5 March that marked the event’s fifth anniversary over the weekend ended with a rally at the Alfred E. Smith Houses, Quiñones’ mother’s building. After Sandy, residents had to wait days before water or power returned. Mold, already a problem before the storm, became worse in the weeks and months that followed. Today, Puerto Ricans like Quiñones must relive the trauma of that natural disaster as they see their island motherland face even worse circumstances after Hurricane Maria. Quiñones has family on the island. Her brother-in-law, Efrain, and his wife, Irene, fled to New York City roughly three weeks ago from a middle-class neighborhood outside San Juan. The couple, 66 and 57, required access to medicines and doctors that Puerto Rico’s shattered infrastructure can no longer offer. They were forced to leave behind their then-pregnant daughter, and her newborn. Disasters like Hurricane Sandy and Maria are especially unforgiving to the sick and the elderly. Quiñones remembers taking responsibility for her mother, who just turned 80 on Saturday, on that fateful day five years ago. Her mother suffers from chronic obstructive pulmonary disease, a condition resulting from the accumulation of carbon dioxide in the body that makes it hard for patients to breathe. She requires a CPAP machine to help her safely sleep at night and pump oxygen into her body. She refused to go to a shelter, so Quiñones, her two sisters, her brother, his wife, and four of her nephews braved the storm in her mother’s apartment on the Lower East Side. They stayed put until the morning. By then, the power was out, and water wasn’t running. Luckily, the family had back up oxygen tanks for the birthday girl, but their building was no longer safe. They had to leave. That’s what’s been hardest for Quiñones—the memory of displacement, as she headed north to stay with family in Harlem until the power returned to her neighborhood. It’s haunted her to this day. Displacement is one of the gravest threats natural disasters and climate change alike pose to individuals. Sandy left more than 775,000 people displaced, according to the International Displacement Monitoring Center. This pattern continues in Puerto Rico today. Bloomberg reported Sunday that the Trump administration is looking into how to provide housing on the mainland to displaced people from the island as the situation remains dire. More than a month since Hurricane Maria struck Puerto Rico, only 33 percent of the island has power. People are already fleeing. In Florida, more than 73,000 Puerto Ricans have arrived since Hurricane Maria. New York hasn’t released any official numbers, but Puerto Ricans are constantly moving to the city, and that trend is only expected to increase in wake of Maria. Efrain, Quiñones’ brother-in-law, is determined to return home, even now that he can see the relative safety New York offers him. His daughter and grandkids remain there, after all. He’s been in contact with them, and is trying to find an apartment in New York so that his daughter can come live with them. His sister in Puerto Rico tells him that the lights come and go every day. Their generator requires heavy maintenance if they want light at night. There’s still no water, even in their middle-class neighborhood. That’s not the case on his island. Despite the pain of watching as Puerto Rico continues to reel from Hurricane Maria, Efrain and his family aren’t letting any storm press pause on their lives for too long. Over the weekend, five years after Hurricane Sandy and 39 days after Hurricane Maria, they all gathered back at Quiñones’ mom’s house. The same home where the family braved Hurricane Sandy. In spite of everything, spirits were high. They gave thanks to having another year with their oldest family member. Quiñones’ mother might pass any day now. Immediately following Sandy, she was diagnosed with an aneurysm in her heart’s main blood vessel, a condition that has only worsened since. Every day with her is special, but her birthday is especially memorable. The family gathered around that Saturday, eating all day long. Eggs for breakfast, ensalada de bacalao (salted cod salad) for lunch, and pernil (slow-roasted pork shoulder) for dinner. They could hear salsa from outside the window. The Sandy 5 March was taking place right outside the building. Maria took it all in: “I could have lost her then,” she thought, remembering how her mother got ill after Sandy. But she didn’t—and her family remains strong as it now confronts Hurricane Maria’s damage. Nothing will stop them. Not the rains that came down this weekend, invoking memories of Sandy. Not the distance that stands between them and their family in Puerto Rico. Not even the realization that these storms will happen again. Because they have each other. They have their community, and they still have their resilient Boricua spirit.